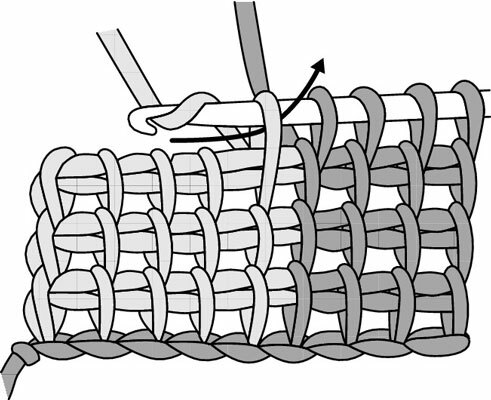 Crocheting basic afghan stitch produces a gridlike pattern, so it’s excellent for creating colored designs. 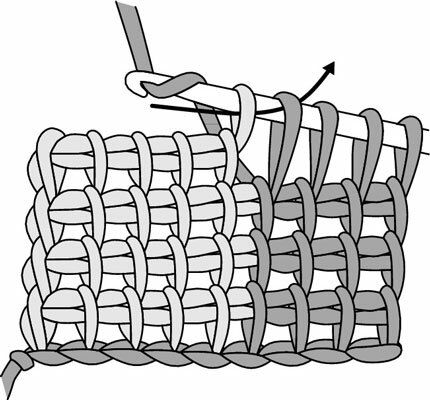 Most patterns that call for color changes in afghan stitch provide a chart to show where you switch colors. Follow a color chart for basic afghan stitch color changes. 1Draw up the designated number of loops of the first color according to the squares on the chart. 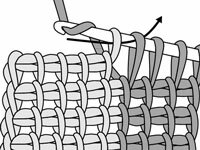 The first loop on the hook counts as the first stitch of the row. 2When you need to switch to a new color, drop the first color to the wrong side. You want to be able to pick it up in the second half of the row. 3Insert your hook in the next stitch, yarn over (yo) with the new color, and draw that yarn through the stitch. Be sure that you have the new color behind your work. 4Continue by drawing up the designated number of loops of the new color. 5Repeat the preceding steps from when you switch colors for each section of a new color across the row of the chart. For the second half of the row, work off the loops with the matching color until 1 loop of the current color remains on the hook. 6Pick up the next color in sequence from the wrong side of the work, drawing it under the working end of the first color, and yarn over. Drawing the next color under the first color twists the yarn to prevent holes in the work. 7Draw the new color through 1 loop of previous color and 1 loop of matching color. 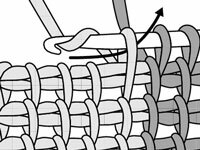 Repeat the preceding steps from working the second half of the row as needed across the row until 1 loop remains on the hook. 8Repeat all the preceding steps for each row of the chart. Practice color changes as much as you need until you feel comfortable with the procedure.